All kinds of lighting design software are available today, the benefits of CAD and visualisation tools are undeniable. On Stage Lighting regularly hears from first time lighting designers including BTEC students, asking the best way to draw lighting plan. 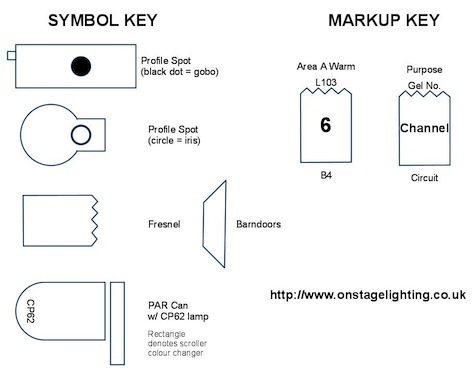 This article looks a the basics of planning a lighting design and the real purpose of drawing a good stage lighting diagram. *Note that there are CAD video resources at the On Stage Lighting YouTube channel, including tutorials on Vectorworks and AutoCAD. A Stage Lighting Plan is…? The lighting plan is the Lighting Designers tool, planning the location of lighting equipment and communicating information to everyone else. Originally drafted on paper (cave painting of fire beacon designs have yet to be found) CAD has taken over but let’s forget about grids, snaps and polysplines for the minute. The plan (some people call it a “plot” or the “Desperate” in Lampie rhyming slang) is the bird’s eye representation of the venue, lighting positions and fixtures. During the design stage, the LD uses it to experiment with angles and placements. After the design is finalised, the lighting crew use the plan to rig, plug up and focus the fixtures while the LD refers to the plan to find dimmer channels when setting the light levels. What form should my lighting plans take? I have probably drawn as many plans on the back of tour schedules as I have CADed and Wyg-ed up full english breakfast drawings. The plan doesn’t need to be complex, it just need to fulfill its purpose. If it’s to show the local crew where to hang up stuff, a fag packet sketch is going to be fine. It’s all you can do in half an hour while they’re unloading the truck, anyway. When learning stage lighting, it’s tempting to try to use every available tool at your disposal to create a drafting masterpiece that could cut it at Tate Modern. That’s fine and a good way of learning the software. Don’t forget that drawing a lighting plan is not the same as doing a lighting design – try not to let your struggles with symbol libraries become the entirety of your day. A nice compromise between a blunt pencil sketch and multi layered, block ridden hell is a tidy scale drawing of the venue with some standard lighting symbols and clear text. Scale drawings are important, even if they are only simple line representations of bars and fixtures. It’s impossible to use the lighting plan to make design decisions if the bars are not the right length (or in the right place) and the lantern symbols are way out of proportion. You could do a simple computer drawing with something like Sketchup or just use a pencil and paper. 5mm squared paper is great as a quick aid to scale drawing using something like 1 square to 500mm or 1 ft – whatever fits your venue on the drawing. If you’re going to draw, start in pencil and don’t ink anything in until the last minute. Using tracing paper “layers” can keep your venue / set drawings seperate from the LX plan. It’ OK to “cheat” some of your rigging positions to within the sheet limits if they are a long way from everything else. Just remember to take this into account when planning throw distances and angles. Below is an example of a lighting bar, showing lanterns and data. A critical element when drawing a lighting plan is the representation of lighting fixtures. Before CAD, the lighting designer drew with plastic stencils and this method reminds us that complex pictures of lanterns with every nut and bolt are pointless. The symbols need to be clear, recognisable and have some room to insert vital information such as gel colours etc. The scale of the symbols, although not always an exact footprint, should represent how much room a lantern might take up on the bar. When drawing lantern symbols, it’s good to “point” the lantern in the direction of focus rather than plonking them all in the “straight ahead” position. This show up any potential problems with fixtures rigged too close to each other – another reason why symbol scale is important. There are some recognised generic lantern symbols that clearly show profile spots, fresnels and floodlights and you can add to these with your own depending on the different types of fixture of your show. It’s just important that the lighting crew can easily tell one fixture type from the next. This is often a problem with using manufacturer’s CAD symbols – they are complex and look too similar without close inpection – Spots vs. Washes for example. A good lighting plan should have all the available information for the electricians and crew to work from when rigging the equipment. This makes it a little annoying when the crew ask you a question that they could’ve found the answer to on the drawing but…..! Communication with the lighting crew is what it’s all about. The lighting plan will also contain aide memoirs about other Lighting Designer-y information for you to use during the focus and plot. Each fixture might have the gel number, circuit hook up, dimmer channel, DMX address and job/focus as well as details of accessories such as gobos or irises. The important thing it so keep these number and notes clear and uniform. Some LD’s put their gel number in the centre of the lantern symbol which is where others might insert the control channel. Some symbols have the beam angle of a fixed profile spot on the lens tube, on other plans this might be where the gobo number is. Just make it make sense and the same for every symbol on your plan. Other areas of the plan might show particular infrastructure notes, patch panels, multicore numbers or details of power and dimming positions. Laying out technical details will also help you or your electrician create the equipment inventory needed for the show. Cable runs calculated and extra kit ordered. If you are looking for more information on conventions, search for “USITT Theatrical Lighting Design” to see their document outlining their take on the standards and conventions for the ways to show lighting plan information, many of which are use throughout the theatre industry and beyond. Here are some examples of generic symbols and some conventions to show data such as channels or gel numbers. Drawing a lighting plan is not lighting design. Using drafting techniques to communicate ideas is part of the lighting designers armoury. If you are doing your first lighting design, create a simple scale layout of your venue and using symbols to represent your lighting equipment. And maybe break out the CAD on a rainy day. This note is for students working within the UK BTEC Production Arts at Level 3 in the UK. 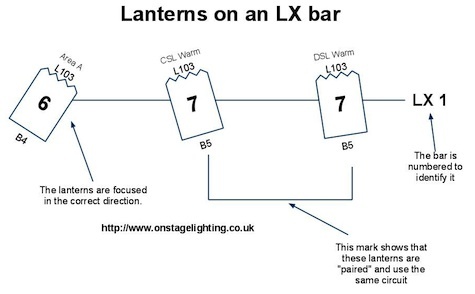 According to Edexcel marking criteria for the lighting design unit, in order to achieve a PASS, the learner must demonstrate the ability to communicate a lighting design and and at least “produce accurate manual drawings using established conventions.” This means working carefully to scale, using technical drawing tools to ensure clean and accurate drawings, using standardised lantern symbols, all marked up with gel numbers, dimmers or other information using conventional notation recognisable by a lighting team. There is plenty of information on these techniques, both the USITT guide mentioned above and any good book on stage lighting. In order to gain a MERIT, the guidelines tell us that the learner must evidence both an level of competence in both hand drawn and some form of CAD, while a DISTINCTION also includes some level of visualisation using either CAD or an actual model. The next step on the road to a good mark is to make sure that you understand scale and elementary technical drawing, can draw accurately and neatly and have researched conventions for representing theatrical lighting equipment and design ideas on paper. Good Luck. Thanks!!! Great source for an old techie from another industry, starting to get a grip on the matters and lingo related to theater. Good site and BIG help!